Deism is a simple philosophy that teaches just two things: 1) One should base all of one’s beliefs on reason, and 2) reason leads one to conclude that God (the being who purposefully created the universe) exists or at least probably exists. Sounds good, doesn’t it? It is, but it is only the beginning of an adequate personal philosophy. Using reason, compassion, and hope, I have expanded Deism to help people be as sane, good, and happy as possible. You want to know the purpose of life and how to best live it? Then The Book of Expanded Deism is for you! A theology is a system of beliefs about God, and perhaps every human has a theology. We need to have a theology to construct an adequate personal philosophy to deal with reality and live wisely. The better our theology, the better our personal philosophy. But what is the best theology? Judaism? Christianity? Islam? Hinduism? Atheism? Agnosticism? Something else? What Is the Best Theology? : 3rd Edition answers this question in a very user-friendly way. Spoiler Alert! The answer is Deism. Read this book to learn why. Many people complain about how various nations acted throughout history. Among other things, they say that nations should not have been absolute monarchies that were scientifically illiterate and un-egalitarian, enslaved foreigners, started unjust wars, and committed the genocide of indigenous people. That is easy to say. What is not easy to say is what exactly a European nation should have done from the year 1000 C.E. unto the present, and that is what Jasonia: How a Nation Could and Should Be does. This book is an entertaining and edifying alternate history of the world from the perspective of the make-believe nation of Jasonia. Jasonia did not exist, but something like it should have. Hopefully, this book will help Jasonia-like nations develop throughout the world in the near future. I used to be a devout Christian, and, as such, I was convinced that every assertion in the Bible was somehow true. It might not be literally true, but it was at least figuratively or allegorically true. 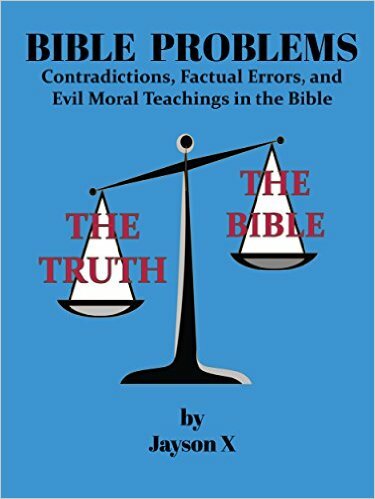 Then I came to the conclusion that the Bible is probably a very flawed book with many contradictions, factual errors, and evil moral teachings. Inside the cover of one of my Bibles, I started recording Bible verses which seemed to me obviously false and/or evil. I did this to embrace the truth and free my mind from the childish trust I had in the Bible. In other words, I wanted to completely break the spell that kept me from thinking honestly and freely. I am now sharing what I learned with others to help them think honestly and freely too. As of August 16, 2015, I have been the Deputy Director of the World Union of Deists for over eleven years. As such, I have answered countless emails from around the planet. Deist Emails is basically a collection of over 120 of my best answers on topics such as abortion, Buddhism, Constantine and the New Testament Cannon, and the relationship between Deism and science. Practically every popular topic of philosophy, religion, politics, and economics is covered in this magnum opus. All these books are sold on Amazon. Just click on a cover below to go to its Amazon site. Last but not least, please feel free to email me at jayson@deism.com if you have any questions or comments. Hi Burt, I am honored to have your rant on my blog site. I too live in the Bible Belt–Texas to be precise. Your story reminds me of a time that a coworker asked me, “Why aren’t you a Christian anymore?” I said, “I stopped being a Christian mainly because I stopped believing in the miracles of the Bible.” Then she said something to this effect: “That’s sad.” “Why?” I asked, and I can’t even remember her response. Good luck raising your grandson. Teach him to base his beliefs on reason, compassion, and hope, and I believe that you can’t do any better. I’m glad to help. It’s tough being an ex-Christian cleric around Christmas time, isn’t it?